The role of woody debris in providing habitat for aquatic organisms is better understood through research by freshwater scientist, Brenda Baillie. The management of woody debris following harvesting operations is the focus of a study by Scion freshwater scientist, Brenda Baillie. 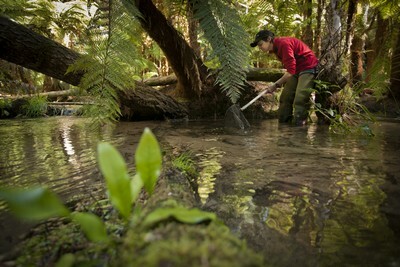 Brenda’s PhD project involved a large catchment-scale study on the function of wood in New Zealand’s stream ecosystems. Her research demonstrates how branches and logs play a vital role in keeping streams healthy and nurturing their aquatic inhabitants. In areas where forests have been cleared, the removal of wood from streams is detrimental to aquatic life. “We know that longfin eel numbers are in decline due to over fishing and loss of habitat. Depletion of wood is a contributing factor, as it provides deeper pools with cover. Many native fish species are similarly affected,” Brenda says. 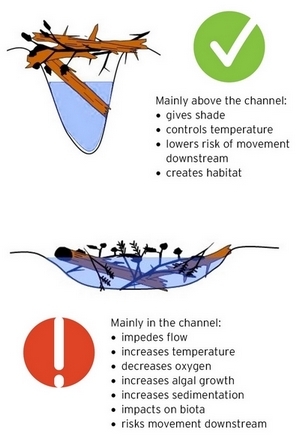 While forests are good for streams, difficulties can arise during harvest. When too much slash is left in stream channels, it harms the ecosystem and creates risk of debris moving downstream during heavy rain. Brenda insists that keeping streams free of wood is not the answer. “Forest and resource managers can make better use of wood in streams to reduce flooding risks and enhance New Zealand’s stream environments,” she says. She recommends that large, stable pieces of wood are left in smaller sized streams, providing a win-win for both the stream and the forestry companies. Recommendations arising from Brenda’s PhD study have been incorporated into slash management plans for forestry companies and regional councils. Her research also made a valuable contribution to the proposed National Environmental Standard for Plantation Forestry. Hancock Forest Management (NZ) Ltd assisted with Brenda’s research and began incorporating her results early on. Environmental Manager Sally Strang says that this project is a rare example of an academic PhD study that has immediate practical application. 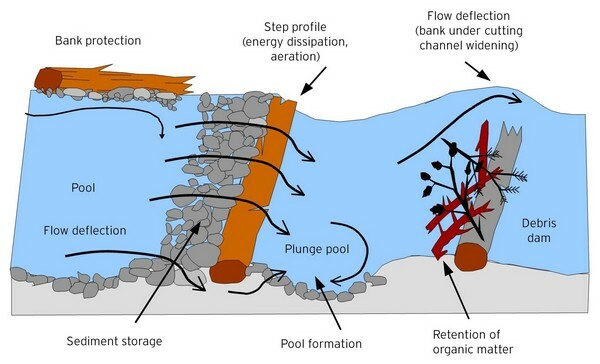 “Management of harvesting woody debris in streams has been the subject of a lot of discussion over the years, both within forestry companies and with our regulators. We’ve debated over whether harvesting wood should be fully or partially removed and, if the latter, what portion do you remove - the small material or the large?” Sally explains. Retaining large stable pieces of wood that do not impede flow provides benefits to invertebrates and fish, similar to native forest streams.